Originally based in Udine and Friuli Venezia Giulia, Sereni Orizzonti SpA now operates in 10 Italian regions with 85 facilities currently active. Our residential facilities have a total of about 5250 beds, which places Sereni Orizzonti SpA among the top operators in this sector in Italy. Our staff are all skilled professionals, experts in providing the specialist care required by each individual resident. In 2017, Sereni Orizzonti SpA employed 150 new staff members and now has about 2900 employees altogether, a number that is set to increase with new facilities due to open. In order to consolidate our market position, Sereno Orizzonti SpA has an investment plan totalling 200 million euros for the 5-year period 2019-2020. 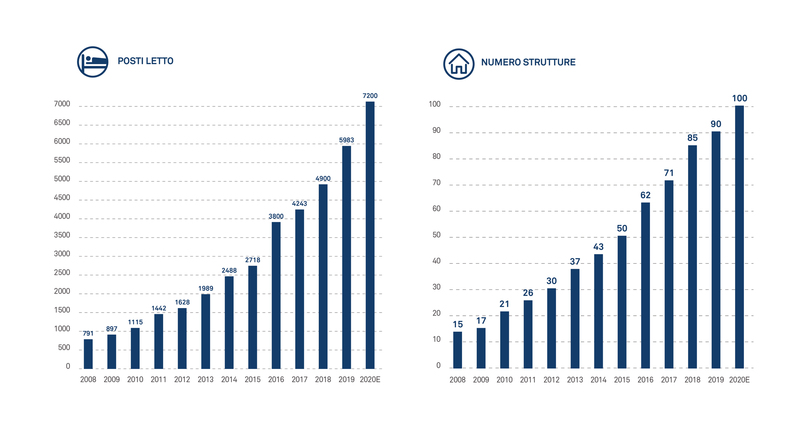 8 new building sites have opened in the first quarter of 2017 (for completion in 2018) in San Mauro Torinese (120 beds), Marcon (VE) (120 beds), Rodano (MI) (90 beds), Macomer (NU) (40 beds), Genova (GE) (110 beds), Milano (MI) (80 beds), Sanluri (VS) (80 beds), Fiesco (CR) (80 beds). 6 sites are planned for 2018 (for completion in 2019): Cinto Caomaggiore (VE), Antrodoco (RI), Castenaso (BO), San Gillio (TO), La Loggia (TO) and Borgo Ticino (NO). And finally, 3 new residential care homes are due to be handed over between July and September 2017: Pasian di Prato (UD) (120 beds), Piacenza (75 beds) and Torre di Mosto (VE) (90 beds).